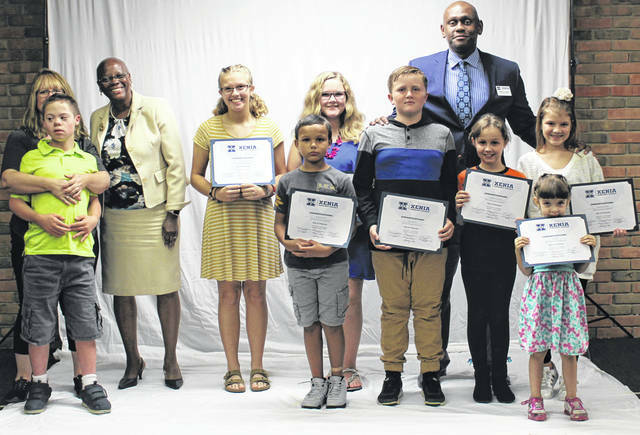 XENIA — Nine Xenia students were honored at the October Board of Education meeting by being named kids of character. Recognized were Carleigh McFarland, Isaac Brown, Cheyanne Mullins, Karter Hawkins, Colton Garcia, Aubrey Moore, Julie King, and Tali Riley. McFarland is a fourth grader at Arrowood Elementary School. Homeroom teacher Jamie Conner said McFarland is an Arroowood All-Star because she is always respectful of her classmates and teachers. She works hard to do her best each day. She is kind and helpful to others. Brown is a new student at Cox Elementary School. His teacher enjoys having him in class because is a hard worker and a great class leader. Brown always takes pride in himself and he always has his homework completed. He shows the shining star character trait of being a problem solver, since he is new to the building and has found a way to make this new experience a positive one. Mullins is a fifth grade student at McKinley Elementary. She comes to school each and every day with a positive attitude and a caring heart. She is kind to her peers, kind to her brother, and kind to the other children who live in her home. Each day she walks her younger siblings in to school and makes sure they get where they need to go. She is the peacemaker among her peers and does not involve herself in any negative peer issues. Hawkins is a student at Shawnee Elementary School. The word “responsibility” comes to mind when his teacher Maggie Purdin thinks of him. He comes to school everyday ready to learn. He unpacks quickly and heads right to his desk to start his work. Hawkins is often seen helping others, scooting chairs in for those that forgot, picking up trash, and making sure the classroom is tidy and safe for all students. Garcia is a student at Tecumseh Elementary School. He is the school’s superhero this month because he demonstrates positive character traits in a number of ways. First, he enjoys working hard at school and smiles and laughs when he finishes his work activities. Next, if a task is hard he will try again and again without getting frustrated — the sure sign of a problem solver. Moore is a seventh grade student at Warner Middle School. She bubbles over with school spirit. She takes pride in her school and her enthusiasm is contagious. She was such an amazing example of school spirit to her student peers during each day of spirit week this fall. She also helped to plan the pep rally and volunteered to bring in pep rally game supplies. Academically, Moore has the most challenging course load offered for seventh grade and consistently demonstrates strong testing ability on the Ohio State Tests each spring. Reily is a student at Xenia Preschool. She is very kind, caring, and an excellent role model for her peers. She follows directions well and knows the routine of the classroom. At recess, she is very friendly and plays well with all students. If someone falls down, she will be there to help them up and make sure that they are OK. In the classroom, she is always ready and willing to help the teachers and her classmates.